A decision on whether a new 15,000-seat stadium is built in Melbourne’s southeast is expected within days. The Andrews Government will meet Football Federation Australia this week to discuss whether the $170 million stadium would be home to Melbourne’s third A-League team. Government and FFA executives will discuss the merits of the venue, which would also become an entertainment hub for the fast-growing region. A decision on whether the new venue is built next to Dandenong station could hinge on how the FFA awards one of two new A-League licences for 2019. 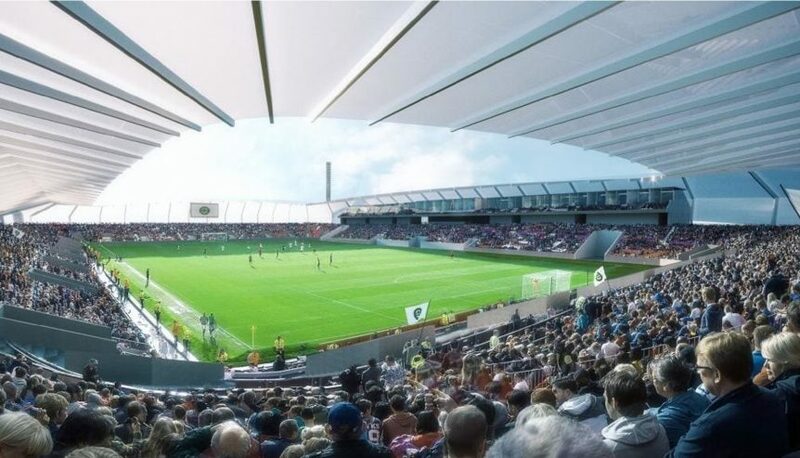 What the new Dandenong stadium would look like. Government spokesman Ben McNair would not say whether it had decided to help build the stadium. “Victoria is the sporting capital of Australia and already home to the best two clubs in the A-league,’’ he said. If FFA approves a bid for a south east club currently known as Team 11 to play in the national league, the Government is expected to bankroll construction of the development. An economic study estimates it would generate $114 million of annual economic output in southeast Melbourne, create 444 ongoing jobs and attract 465,000 people each year. Bids for a licence to join Melbourne Victory and Melbourne City in the A-League have also been submitted by South Melbourne and a self-funded Western Melbourne bid team. The location of the proposed Dandenong Stadium. A decision on the successful bid is likely next week, following an FFA board meeting. The stadium deal is crucial to Team 11’s bid and a decision on whether the venue is built on land gifted by Greater Dandenong Council could be made even earlier.